Hong Kong, China (CNN) -- Toyota's vehicle recall in China pales in comparison to the world's largest automaker's recalls in the United States in recent months. But the long-term impact of the recall in China -- now the world's largest auto market -- may be huge as Toyota tries to grow its foothold here. Thursday's recall in China of 75,500 sport utility vehicles because of potential accelerator pad problems is part of a global recall that includes 5.3 million cars in the United States. But this is Toyota's fifth vehicle recall in China since January 2009. "This is monumental for Toyota," said auto analyst Michael Dunne, president of Dunne & Co. based in Hong Kong. "It's almost like a hex has descended on them in China. It makes Chinese consumers begin to doubt the invincibility of Toyota product quality." Other recalls this past year include a 690,000-car recall in August because of faulty window controls and a 259,000-vehicle recall in April to fix brake systems. 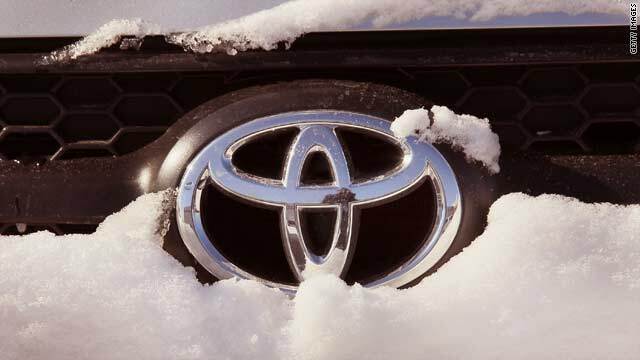 Video: Will Toyota keep consumer loyalty? Toyota may be the top seller in the world, but in the all-important Chinese market the company ranks a distant fourth in passenger vehicle sales. Toyota has a 7.8 percent market share in China compared to the Volkswagen Group, which accounted for 16.5 percent of passenger vehicle sold here last year, according to J.D. Power and Associates. "China's very important to Toyota, but they've had their problems in China --- the market's boomed here, but we're not seeing Toyota grow as fast," said John Bonnell, director of forecasting for J.D. Power and Associates Asia-Pacific. The passenger car market in China grew 48 percent last year, Bonnell said. Toyota's sales grew 21 percent in 2009, a company spokesperson said. The world's top automakers are jockeying for position in China to build brand and customer loyalty. "(China) is a car market that's (a) very recent market, which means Chinese consumers are only now discovering new cars, so it's an open book, you can write the story now in China," Carlos Ghosn, chairman and CEO of Renault-Nissan, told CNN's Richard Quest on the sidelines of the World Economic Forum in Davos. "When I say we are writing the book, they are not deciding out of memory -- they are deciding what they see in front of them." In Tokyo on Friday, Toyota remained tight-lipped on plans to deal with the global recall which involve two separate problems -- gas pedals that stick on their on, or get caught on removable car floor mats. In the U.S., 5.3 million cars have been recalled due to either problem, and the recall expanded to China and Europe on Thursday. It's not immediately known how many vehicles will be affected in Europe. The Japanese government, however, weighed in on the issue Friday. "The scale of this is large," said Masayuki Naoshima, Minister of Economy, Trade and Industry. "We want Toyota to deal with this problem seriously and maintain consumer trust."